People might call Milano-Sanremo a sprinters’ classic, but that’s of no concern to Julian Alaphilippe. The French wonder continued his impressive streak of wins Saturday in the 291km race through Italy. In the end, he conquered some big stars: world champion Alejandro Valverde, former Sanremo winner Michal Kwiatkowski, and three-time world champ Peter Sagan. How did he pull it off? And what the heck was Sagan doing in that finish sprint? Let’s roundtable! Fred Dreier, @freddreier: I found it to be just as thrilling as previous editions, with the caveat that I tuned in with 40km to go. I think this version was particularly exciting because of the world-class riders who made the front group after Alaphilippe’s attack on the Poggio. Check out the resume of the riders who made that move: Matteo Trentin (European road champion), Alejandro Valverde (2018 world road champion), Michal Kwiatkowski (2014 world road champion), Peter Sagan (2015-17 world road champion), Wout van Aert (2015-18 world cyclocross champion), Tom Dumoulin (2017 Giro d’Italia champion), Vincenzo Nibal (reigning MSR champion), plus Oliver Naesen and Matej Mohoric. All of these riders had the pedigree to contend for the win. Spencer Powlison, @spino_powerlegs: I agree that the final selection was an all-star line-up. However, I felt that the action was too controlled. Apart from Alaphilippe’s effort to split things up on the Poggio, there were precious few fireworks in the last 30 kilometers of Sanremo. The finale was thrilling (it always is), but as a whole, this edition doesn’t compare to last year or 2017 when it comes to edge-of-your-seat action. Andrew Hood, @eurohoody: When you have a gang of former and current world champions duking it out down the Via Roma, there’s not much to complain about. Alaphilippe seemed to confirm that adage that the strongest rider always wins. Deceuninck-Quick-Step was nearly flawless, and Alaphilippe is a man on a roll. No sleep ’till Brooklyn. Sanremo used to be a pure sprinters’ classic, but in the last three years, the puncheurs have triumphed. What’s the explanation for this trend? Fred: The key is that the attacks on the Poggio have drawn out small groups of puncheurs, who are then motivated to drive the pace to the finish. These attacks go even in the years that end in a bunch sprint. However, the attacks often stall on the descent and run-in to the Via Roma. The big difference is that the riders who attack into this selective group seem motivated to drive the pace until the very end, and then jockey for the win in the final hundred meters, as opposed to doing the cat-and-mouse thing with 5km to go. Spencer: Instead of setting up their pure sprinters as “A” options, it seems like a lot of top teams are using men like Elia Viviani (Deceuninck-Quick-Step) as their ace in the hole. The current crop of puncheurs — Alaphilippe, Sagan, and Kwiatkowski — are confident enough in their sprint skills. They also are willing to collaborate in breakaways, usually. Andrew: I am not so sure that the sprinters’ days are over. There are too many explosive riders like Sagan and Kwiatkowski in the peloton right now. They have the legs to go the distance over the Poggio to dust the sprinters. Another key factor is there are not any major teams built solely around sprinters these days, such as in the days of Cipollini or Petacchi. Caleb Ewan now has the full backing of Lotto-Soudal, so the sprinters could well have their day in the Italian sun soon enough. What do you think happened with Sagan in that sprint finish? What was his biggest mistake? Fred: I don’t think Sagan had the legs, simple as that. In normal circumstances, you would obviously choose him ahead of Alaphilippe in a flat drag race to the line. But Alaphilippe is riding a wave of amazing form, and Sagan is not at his best. In my mind, Alahilippe is just stronger than Sagan at the moment. And that’s definitely the case after 298 kilometers of racing. Alaphilippe is just better. Spencer: Alaphilippe definitely has the edge right now in terms of form. That said, I suspect Sagan was wary of following the Frenchman’s wheel in the final sprint for two reasons. One, Alaphilippe was very active on the Poggio. Two, Alaphilippe helped close down gaps to attackers leading into the sprint finish. When you see someone make those efforts in the last kilometers of a long race, you start to second-guess whether they have anything left to really contest the sprint. Seems like Sagan might have underestimated Alaphilippe. Andrew: Sagan was just missing that extra bit of finishing speed. He had a rough spell with some illness in his preparation at Sierra Nevada, and you could see that in Tirreno he wasn’t at his fastest. Sanremo isn’t easy to win for a rider like Sagan, who is always the marked wheel. Someday he might strike gold, but other riders like Boonen have never mastered the race’s mysteries. 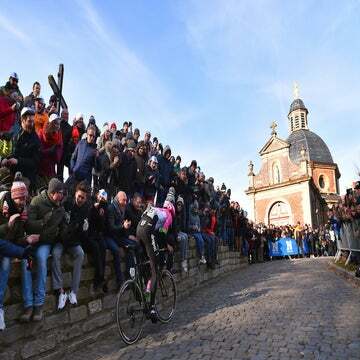 Looking ahead to E3 Harelbeke Friday and Gent-Wevelgem Sunday, how can rival riders and teams find a way to snap Deceuninck-Quick-Step’s win streak? Fred: Alaphilippe will not be at these races, which changes the tactics for Deceuninck-Quick-Step. They will need to win with numbers and not simply set up their star rider. 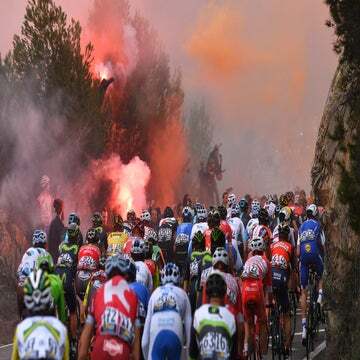 Other teams should take the fight to them and hope that they are able to isolate Zdenek Stybar or Yves Lampaert or Philippe Gilbert in a small group. These guys are unquestionably strong on the cobbles, but neither of them owns as big of an advantage on the other riders in the field as Alaphilippe does at this moment. Spencer: Rival teams need to find ways to burn off Deceuninck-Quick-Step’s key domestiques earlier in the race. If they can set up a dangerous breakaway and force the Belgian team to chase hard, that will make for a fair fight in the closing kilometers — one lead rider per team, unlike in Sanremo when at least three Deceuninck-Quick-Step men were in the mix at the base of the Poggio. Andrew: Deceuninck has mastered its multi-faceted attacking style. It can swarm the front of the race with winners in every scenario. The only way to beat them could be an old-school street brawl with a singular rider who is simply stronger than DQS’s collective strength. I am not sure that rider exists this year, so it’s going to be someone with a fast kick. Without Alaphilippe, the team isn’t the fastest in a reduced bunch, they could be beaten to the line by a speedier finisher. Roundtable: Who will win Omloop and Kuurne?